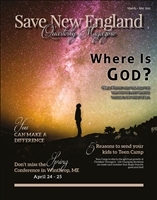 Save New England Quarterly Magazine is a print publication of Save New England Ministry. This beautiful magazine will encourage your heart through powerful articles, convicting truths, upcoming events, and helpful recommendations. God is moving in a unique way in New England. People are being saved and lives are being transformed. Will you help Save New England? This PERSONAL subscription ensures that 4 quarterly issues will be mailed to the address you provide. Automatically renews at the end of 12 months. Cancel any time. This DROP SHIP subscription ensures that 10 copies per quarter will be mailed to the address you provide. Also, it includes a listing on the Church Directory page of the Save New England Magazine. Subscription recurs every quarter. Cancel any time. This DROP SHIP subscription ensures that 15 copies per quarter will be mailed to the address you provide. This subscription recurs every quarter. Cancel any time. This DROP SHIP subscription ensures that 20 copies per quarter will be mailed to the address you provide. This DROP SHIP subscription ensures that 25 copies per quarter will be mailed to the address you provide. Also, it includes a listing on the Church Directory page in the Save New England Magazine. This subscriptions recurs every quarter. Cancel any time.